February 2014 is dominated by two celestial giants – the great nebula in Orion (M 42) and the planet Jupiter. The constellation of Orion the hunter features prominently in the sky for much of February. Its well known and often targeted nebula (M 42) is easily imaged by SPIRIT with exposures less than 60 seconds. A more challenging target is the Horsehead nebula (IC 434). It is best imaged when near or just past the meridian using the H-a filter on SPIRIT I and exposures upwards of 60 seconds. In the south, the large Magellanic cloud – one of the Milky Way’s satellite galaxies – features strongly. A naked eye object under rural skies, the “LMC” contains an endless variety of interesting clusters and nebulae, including the bright Tarantula nebula (NGC 2070). Later in the evening, and as the month progresses, the Eta Carina region will follow the LMC across the southern sky and is similarly rich in nebulae and clusters including the area in and around NGC 3372. Although low in the northern sky, Jupiter, the largest planet in our solar system, can be imaged using filtered exposures of less than half a second. Jupiter’s four Galilean satellites appear easily within the field of either of the SPIRIT telescopes, and if imaged over several nights will show changing positions as they orbit the giant planet. 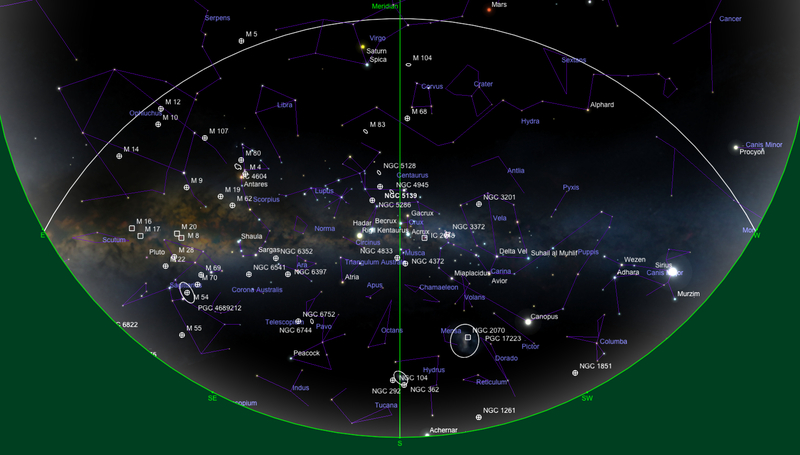 Once imaged, the moons can be easily identified using planetarium software such as Stellarium. For those interested in something different, a number of very bright open clusters are rising during February. These include M 93, M 46 and M 47. These interesting and extended clusters are best imaged with the wide field of SPIRIT II, and exposures of 30 seconds or less. 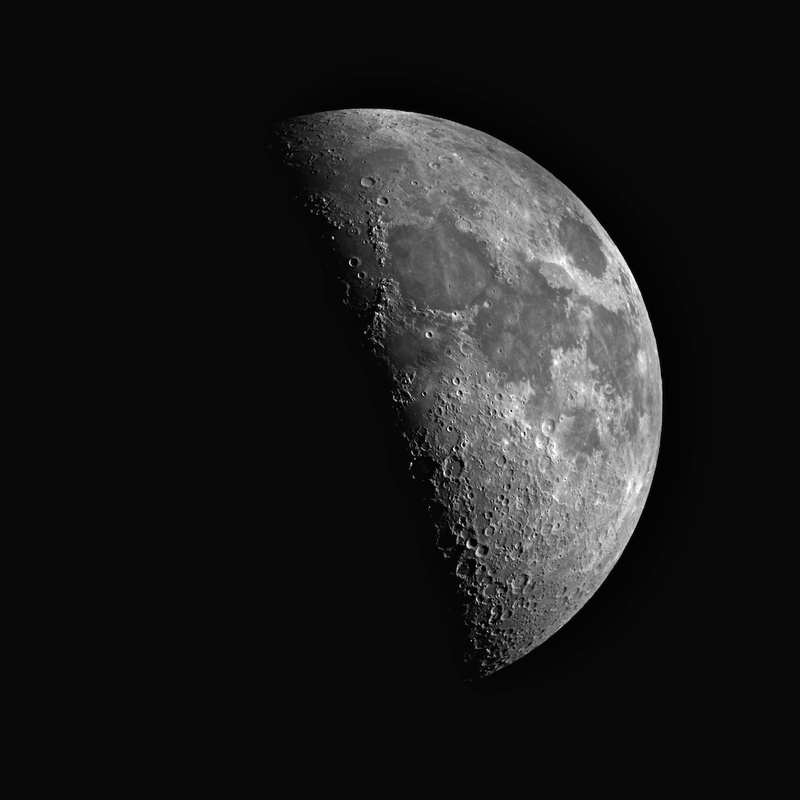 The moon is full on February 15th, so the best times to image faint objects will fall within the first week, or during the last week of the month. With the centre of the milky way now well past the meridian at sunset, it’s time to start looking beyond the bright nebulae and clusters that dominated the skies from July to September. 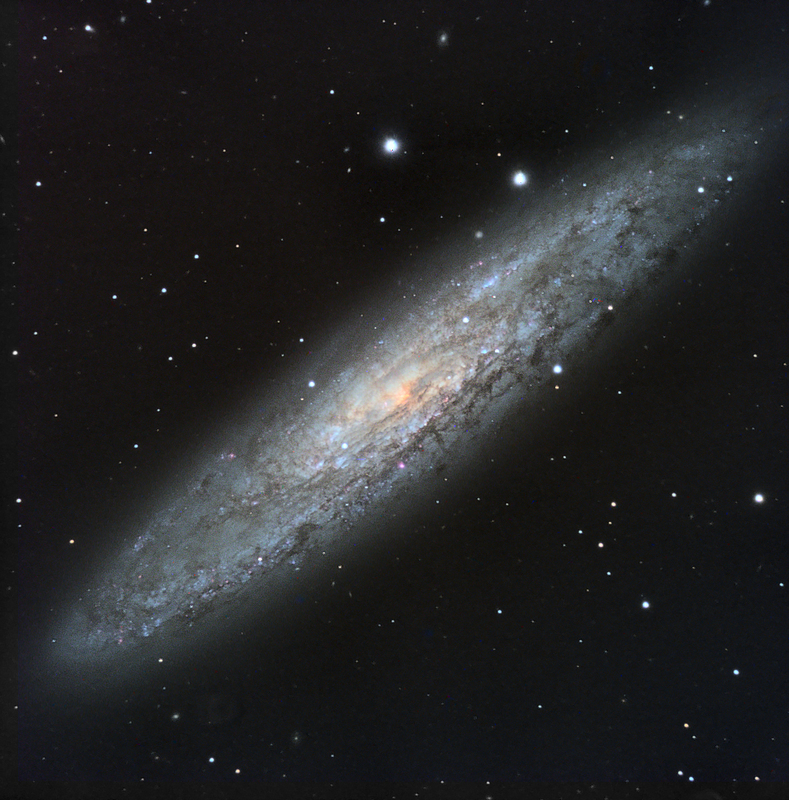 Rising in the east is the magnificent Sculptor galaxy, NGC 253. One of the largest and brightest galaxies in our skies, it fills the field of view of both SPIRIT I and SPIRIT II (check out this image of NGC 253 taken by SPIRIT I in 2011). NGC 253 is one of our closest neighbours in the local group of galaxies and shows areas of intense star formation in its near edge-on spiral arms. October is a great month to plan some long exposures of NGC 253, as it is directly over head at about 10:30pm at mid month. Close to NGC 253 are a number of other galaxies worth targeting, including NGC 247, NGC 55 and the beautiful face on spiral galaxy NGC 300. Longer exposures of up to a minute or more under good sky conditions are required to reveal the detail in these targets. Meanwhile, high in the south east is the impressive globular cluster NGC 104, better known as 47 Tucanae. It too crosses the meridian mid month at about 10:30pm. The second largest globular cluster in the sky (after Omega Centauri), 47 Tucanae and its nearby smaller companion NGC 362 are located close to another member of our local group of galaxies, the Small Magellanic Cloud. 47 Tucanae is uniquely placed in the southern sky and is the envy of all northern hemisphere observers. Imaging this object is a must for all users of SPIRIT, and relatively short exposures (less than 30 seconds) through the red, green and blue filters can be used to successfully create impressive colour images of this interesting globular cluster. September presents the best time of the year to image two famous northern hemisphere objects; the Dumbbell Nebula (M27) and the Ring Nebula (M57). The Dumbbell Nebula is the first and perhaps most famous planetary nebula discovered. The remnant of a sun-like star having exhausted its hydrogen fuel, the dumbbell shape shows the expanding shell of gas ejected by a star after becoming a red giant. The ring nebula also shows an expanding shell of gas around a small white dwarf star. These two planetary nebulae bare no association with planets. They are the remnants of stars that provide an insight into what lays in store for our sun when it eventually reaches the end of its life. 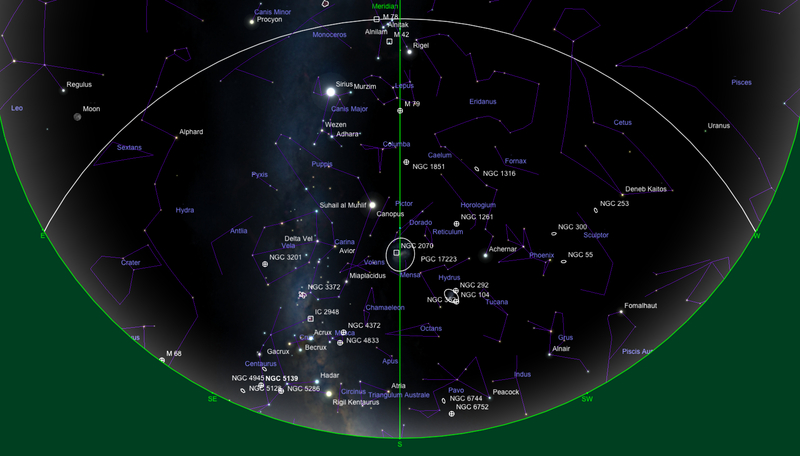 Both objects are low in the northern sky. 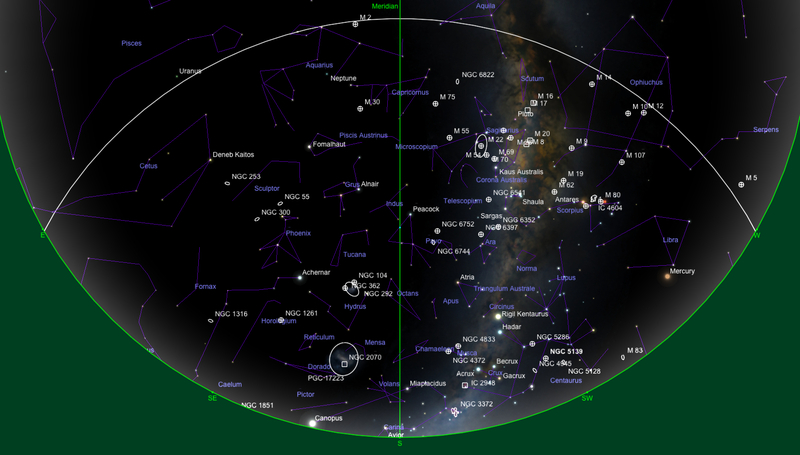 Use Stellarium to plan your timing to capture them at their highest points, as they cross the meridian. The objects can only be reached using SPIRIT II. High overhead mid month is the beautiful spiral galaxy NGC 6744. An easy target for either SPIRIT I or SPIRIT II captured with exposures of around 60 seconds. With the centre of the Milky Way now heading westwards, September is a good month to image the bright Sagittarius nebulae as they are now well past the Perth city glow. The famous quartet includes: M16 (The Eagle Nebula), M17 (The Omega Nebula), M8 (The Lagoon Nebula) and M20 (The Trifid Nebula). A host of globular clusters also lay close to this rich area of the milky way sky. The moon is full on September 30th, so the best times to image faint objects will be between September 8th and September 23rd. 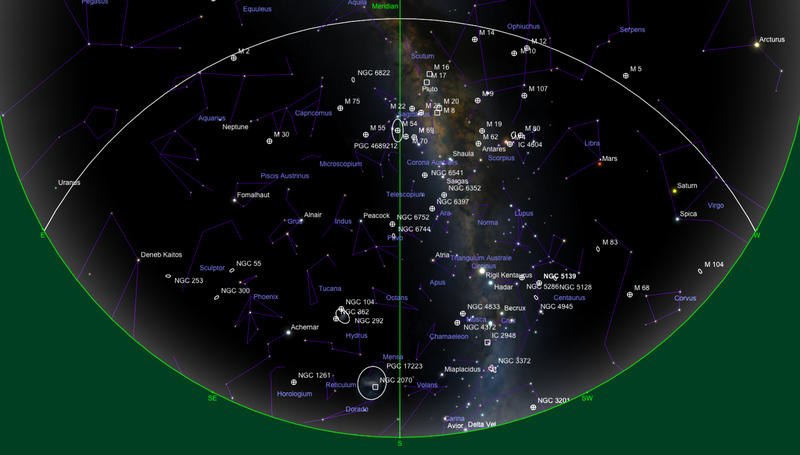 By mid-month, the centre of the Milky way will be directly over head by mid-evening. While you really need a dark sky site to appreciate the beauty of Milky Way, SPIRIT can be used to image the seemingly endless number of star clusters and nebulae which populate the area within and near the galactic plane. Unlike deep space objects such as galaxies, all of these targets exist within our home galaxy. 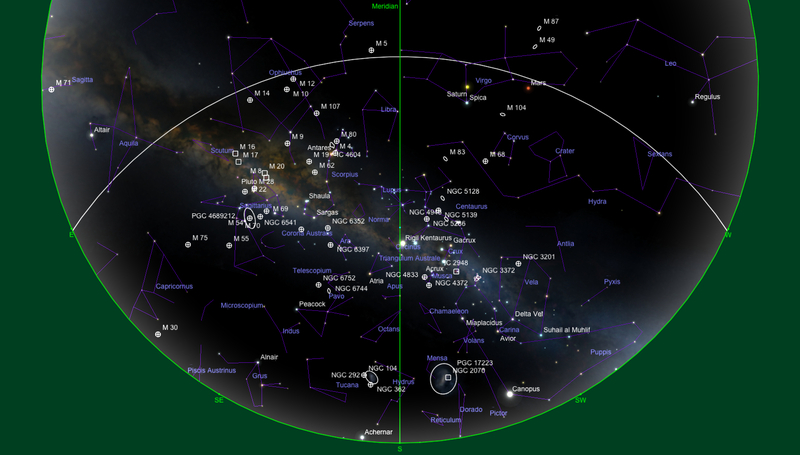 Use Stellarium to zoom in on the region around M 20 and you will have several dozen objects to choose from. August also represents a rare window to image both of the great southern globular clusters, NGC 5139, and NGC 104. To do so you will need to image NGC 5139 early in the evening, as by mid-month it is low in the south western sky. 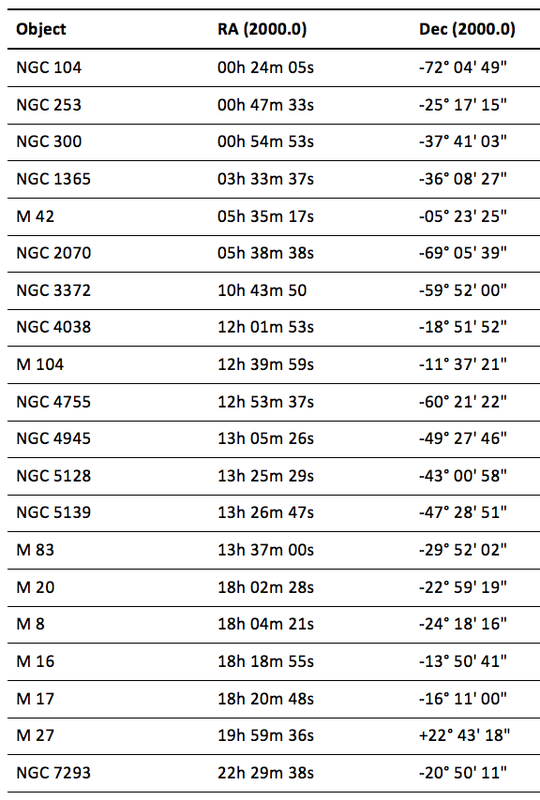 By comparison, NGC 104 is only just rising in the south east, and does not reach imaging altitude until after 10:30pm. August provides the second ‘perfect month’ to image the Sagittarius nebulae mentioned in last month’s instalment. Advanced users may consider creating a mosaic of several adjacent fields, as most of these targets extend well beyond the field of view of the SPIRIT telescopes. Patience, and good image acquisition and processing skills are required, as well as some luck – August being one of the worst months of the year at providing weather conducive to astronomy. Although not a viable target for SPIRIT, Mars will meet up with Saturn for a stunning conjunction in August 2012. Don’t forget to walk outside and look west early in the evening to see these two paired together. They will be closest on August 15. August 2012 provides the rare occurrence of two full moons in one month. Known as a “Blue Moon” due to its rarity (as in the expression, “once in a blue moon”) it will be full on August 2nd and August 31st, so deep sky imaging is best undertaken between August 10 and August 24. The Perth night sky Facing south at 7:30 pm on August 15. With the centre of the Milky Way galaxy rising, July marks the time of year when globular clusters come into their own. The brighter ones include those with Messier numbers, such as M4, M5, M9, and M10. Stellarium and other planetarium programs will reveal a dozen or so nicely placed bright globular clusters high in the eastern sky in the early evening. July represents the last chance you have to acquire good images of the brighter Virgo and surrounding galaxies, such as M 104 and M 83 which are now past the meridian in the west. Be sure to image these early in the evening while perhaps waiting for the the bright Milky Way globular clusters to rise higher in the east. For those with bookings later in the evening, why not try imaging Pluto? A 30 second image will easily capture the faint dwarf planet, but you will need to revisit Pluto a few nights later in order to detect movement of the planet through what will be a dense field of stars. Pluto is well within the Sagittarius region of the Milky Way this month. Winter marks the time of year when clear nights are most often used to acquire images of the bright Sagittarius nebulae: M16 (The Eagle Nebula), M17 (The Omega Nebula), M8 (The Lagoon Nebula) and M20 (The Trifid Nebula). All four will be virtually overhead by 10:30pm mid-month, and present an excellent opportunity to start gathering colour series data if you intend to create colour images. The H-a filter available on SPIRIT I will reveal much more detail in these hydrogen-rich emission nebulae, and can be used effectively during times of bright moon. Speaking of the Moon, It will be full on July 4th, so the best times to image faint objects will be between July 11th and July 26th. 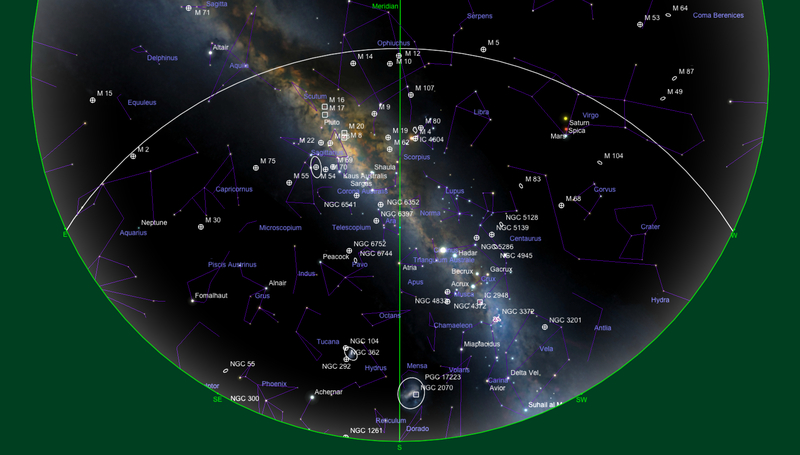 The Perth night sky Facing south at 7:30 pm on July 15. Although now moving westwards, galaxy-rich areas surrounding the constellation of Virgo still dominate the early evening sky, with Virgo directly overhead just after sunset. The Sombrero galaxy (M 104) and the Sculptor galaxy (M 83) are highly recommended targets for those using SPIRIT to image galaxies for the first time. The fascinating radio galaxy Centaurus A (NGC 5128), together with the edge-on spiral galaxy NGC 4945, are also worthy early evening targets. East of the meridian, with plenty of time to spare, is another bright spiral galaxy: NGC 6744. Stellarium and other planetarium programs provide plenty of options for those wishing a last chance to image galaxies at this time of year. Like May, June is a good time of the year for imaging NGC 5139, the great Omega Centauri globular cluster. It is high in the southern sky in the early evening and can be easily imaged using exposures less than 20 seconds. While in the south, you may want to pay a visit to the Jewel Box cluster (NGC 4755). Exposures of less than 10 seconds through red, green and blue filters will provide more advanced users with enough data to create a colour image of this bright open cluster. The hydrogen-rich nebula Eta Carina (NGC 3372) is just past the meridian and moving westwards early in the evening. It’s your last chance to image this bright region before it disappears for the year. For those with late bookings (11:30 pm and later), consider being the first for the 2012 season to image the bright Sagittarius nebulae. They include M 16, M 17, the Trifid nebula (M 20) and the Lagoon nebula (M 8). The H-a filter on SPIRIT I will reveal a wealth of detail in these bright emission nebulae. Saturn dominates Virgo, and although the SPIRIT telescopes are not optimised for planetary imaging, a filtered exposure of less than 5 seconds will reveal its unusual shape and some of Saturn’s brighter moons. Mars is the bright red object in the north west. Don’t forget to wander outside in the early evening to view Mars and Saturn high in the evening sky. With the approach of winter and the centre of the Milky Way rising, now is also the time of the year to consider imaging globular clusters. More on these next month. The Moon is full on June 4th, so the best dates to image deep-sky objects fall between June 11th and June 27th.